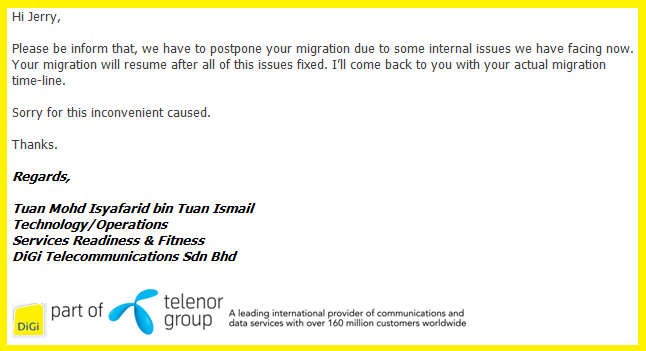 Migration for DiGi's Gateway with Double Opt-In features POSTPONED! Due to DiGi is facing some internal issue now, the migration of EVERWORKS short codes for DiGi's Gateway with Double Opt-In features is postponed until further notice! We will keep you update once the migration date is confirmed! "Double Opt-In" is the term initially used in the email marketing environment, a user has subscribed for a newsletter or other email marketing messages by explicitly requesting it and confirming the email address to be his/her own. This is usually done by responding to a confirmation email sent to the email address in question. This eliminates the chance of abuse where somebody submits somebody else's email address without their knowledge and against their will. When put this term in the SMS content environment, for all the acquisitions or subscriptions of mobile content services, all mobile content services providers shall send a SMS to the acquirer or subscriber, requesting the acquirer or subscriber to confirm his/her request. This action is hereafter referred to as Double Opt-In or Double Confirmation. This action is so important to make sure the user is clear about his/her acquisitions or subscriptions in term of the content charges, frequency of delivery, termination info, etc. ; and this action will further eliminate the complaints and arguments from the users about the unsolicited SMS content as all the relevant info are cleared stated before the actual content is delivering over to the users. FYI, SMS Double Opt-In process has been implemented in some major Telcos in other countries such as USA, UK, Indonesia, China, etc. for years. In Malaysia, this going to be implemented soon in the near future. So, be prepared and happy SMSing! Is SMS Marketing still important for 13th Malaysian General Election? MCMC: "Suspension of all Types of Shortcode for Promotional and Marketing Messages"
FULL List of Domain Extension for Each Country!